Live emotional adventures and unforgettable moments with your mountain bike. Discover the most suggestive spots on Lake Garda and Ledro with the professional guides of GardaMTB Tours! Choose your favourite tour, fasten your helmet and goooo!!! Let's ride the renowned Ponale trail, cross the most suggestive villages of the Garda Valley and visit the historical and cultural places of our land! Deep inside nature, across lakes, rivers and waterfalls, a real paradise for the perfect biker! Let's climb the highest Lake Garda mountains with our mountain bike, discovering breathtaking sceneries and high-adrenaline singletrails! Helmet on your head, protections and a solid bike! A perfect mix of adrenaline and fun on the fastest and most technical trails of Lake Garda! Two days of freeride/downhill fun on the best Lake Garda trails! 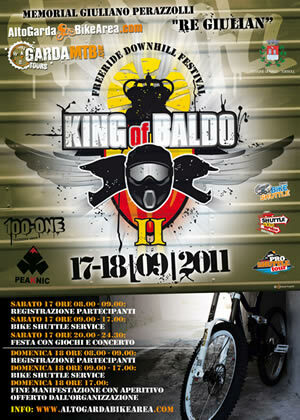 17-18 september, Torbole sul Garda. Contact us for any info! Looking for best bike-hotels on Lake Garda? Recommended bike-hotels for our bike friends. The best way to spend your holidays on Lake Garda, with comfort, safety and a friendly ambience! Special offers and sales with our GardaMTB Card! To be informed about the latest news on GardaMTB Tours!